following up on yesterday's post about the nobel peace prize thought I'd share this letter which I received from the prez late yesterday afternoon just in case you aren't among the millions on the obamas' email list. it is a wonderful letter, no surprise that the prez would like to share the prize with all of us!! we will live as one! thanks president obama and may we all keep our eyes on the prize - peace, love and understanding! today's song the letter by the boxtops, rolling stone ranked it #363 on their list of the 500 greatest songs of all time. mixed feelings about this award - but this is a really good message. Any grist to the mill is a good thing I guess! That letter hits all the right notes. That's exactly what those kinds of prizes are meant to convey. Does anyone remember Sadate and Begin getting the prize in 1978? Not exactly pacifists of long standing, either one of them. It's not a canonization exercise - it's a message saluting a certain trend or tendency. The Boxtops look a bit... raffled? Great song, though. 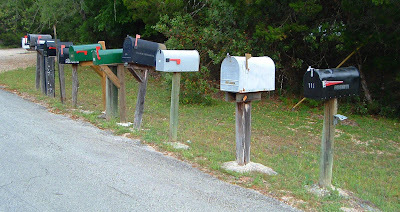 that mailbox photo is so yesterday! nowadays mail is so utilitarian with those big ugly grey locked boxes. wow, kimy. i love everything about this post, including the photo - which looks a little like mail houses on our street. i am certain president obama deserves the prize, and more...i'm still a Clinton warrior, but i am thrilled our president is the current representation for America - i don't feel the "terroristy" itch as much--you know, people like hugo chavez spitting out hate words, the like, the potential. past presidents (except Clinton) were just way too "all the world will bow to us" - the sun belongs to all and so does earth! my great uncle used to say if you keep throwing rocks in someone's backyard, you keep it up, and keep it up, pretty soon they'll throw back. my point: peace is best for humanity, not arrogance or greed! p.s. love you love your work here. thank you!!! Wow that's as unusual as awarding the Nobel Peace Prize to someone who hasn't yet achieved it. He's a pretty impressive dude! Fast acting on this front at least. . . now let's see if he can get a wiggle on and implement the changes he campaigned upon. I'm tired of reading about what he hasn't achieved. I say, full steam ahead. He's done so much to mend so many fences already. Well, enough said. I suppose they should rename it the Nobel Prize for Possibilities. Thanks for sharing this letter with us. I'm with Tut! It hasn't even been a year yet. Give the man some time, and I think he'll do just fine. Yes. I am irritated beyond belief at the reaction of most, right or left, to this award. to read my two latest posts. One is an embedded piece from Rachel Maddow's Fri night show. Her take is fair. The other one from this morning is my husband's reaction to it all. His remarks make the most sense of any I've heard or read. Good Message & bloody brilliant Video!